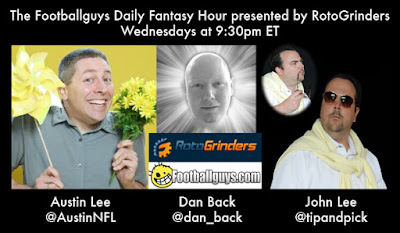 Footballguys has partnered with RotoGrinders to bring you a new hour-long show every Wednesday at 9:30pm ET. Imagine the show is a cake. Who doesn't like cake? The base layer includes standout performances, positional battles, injuries, and upcoming matchups. The top layer adds DFS strategy, like predicting ownership percentages and digging for the sweet upside of bold player choices. The chocolate frosting on top is the wacky-good fun that Austin, Dan, and John will have while helping you win. Mmmm... chocolatey, wacky-good fun. The show premieres this Wednesday. 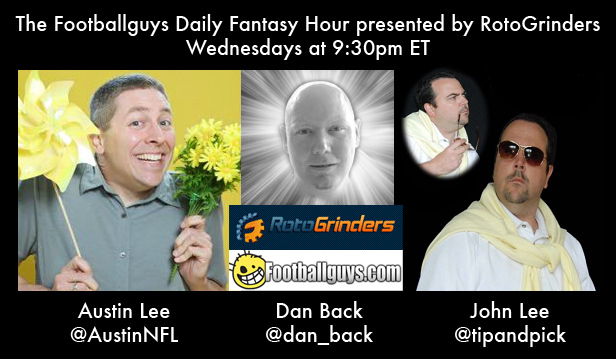 Watch live at RotoGrinders Live or on demand at both sites. Listen to an audio version by subscribing to the RotoGrinders' Daily Fantasy Fix podcast.